This recipe developed, as they often do, by my strong hankering for a certain taste and texture. 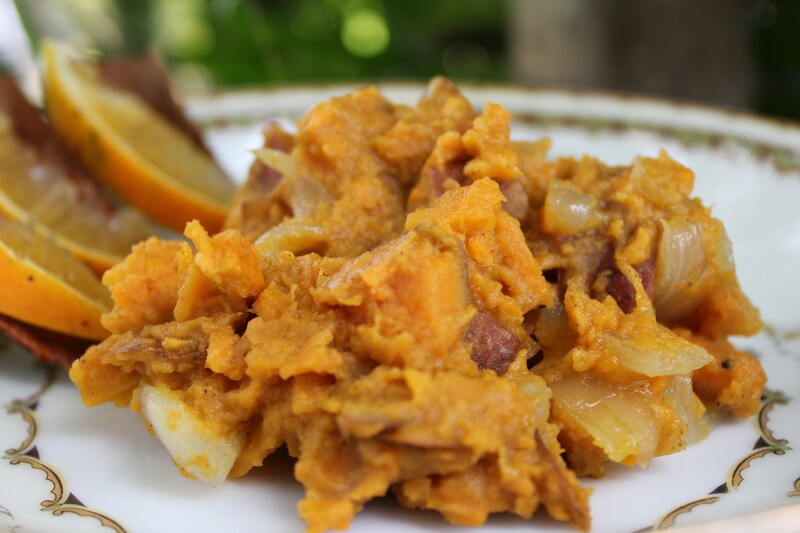 This blend of spices, sweet and savory tastes, combined with the creaminess of the coconut and sweet potato makes a bite just melt on the tongue. Cooling for Pitta and nourishing for Vata, it was the perfect meal to replenish my energy stores and jump start my return to the living. Saffron is a tri-doshic spice, especially healing for Pitta. Saffron regulates the function of the liver, purifies the blood, and regulates metabolism. Adding even a tiny bit of saffron to a meal can help relieve menstrual pain and it promotes fertility (not to mention it’s a natural aphrodisiac). Enjoy! 1. Heat coconut oil in medium sauce pan. Add ginger powder, cinnamon, nutmeg, and onions. 2. Saute for 2-3 minutes until onions are translucent. 3. Add sweet potato, saffron, orange zest, and coconut milk. Cover the pot with a lid and simmer on low for 10-12 minutes stirring occasionally to avoid sticking to the bottom of the pan. 4. Once the sweet potato is cooked through remove from heat and roughly mash potato (not going for purée with this one). 5. Salt to taste. Serve with tossed salad greens.